In Guatemala, the news site El Periódico recently reported that five Guatemalan children, affected by the zero tolerance policy imposed on the families of undocumented migrants by the current U.S. administration in early May, were reunified with their parents in their home country. Journalist Ramón Ignacio Zamora of El Periódico said in an interview with the Knight Center that so far they have identified 11 cases of Guatemalan children who were separated from their parents by U.S. immigration authorities at Mexican border. These cases were found in a data platform created by the U.S. news organization ProPublica at the end of June. ProPublica and its media allies in Latin America and the U.S. have asked the public to submit information about detained immigrants through online forms that feed a database shared with participating media. "Our research team is looking for the people who submitted the reports (via the forms) to interview them and learn about their cases. It is likely that in the following weeks we will be publishing more about it," Zamora said. Currently there are ten newsrooms in four countries that carry out this type of special coverage as part of a collaborative journalistic effort promoted by ProPublica. In addition to El Periódico, the Latin American media convened for this project are Animal Político in Mexico, Plaza Pública in Guatemala and El Faro in El Salvador. From the beginning "we talked about how important it was to contact media in Latin America, especially Central America and Mexico, because the families that are going through this situation and that were being most affected by the zero tolerance policy (from the U.S.) were Central American," María Sánchez Diez, a Spanish journalist with ProPublica, told the Knight Center. Sánchez Diez, who coordinates with the Latin American media allies in the project, also explained that with the collaboration of other media what they sought was to amplify the message and open all possible communication channels with diverse audiences throughout Central America and Mexico to help those families. 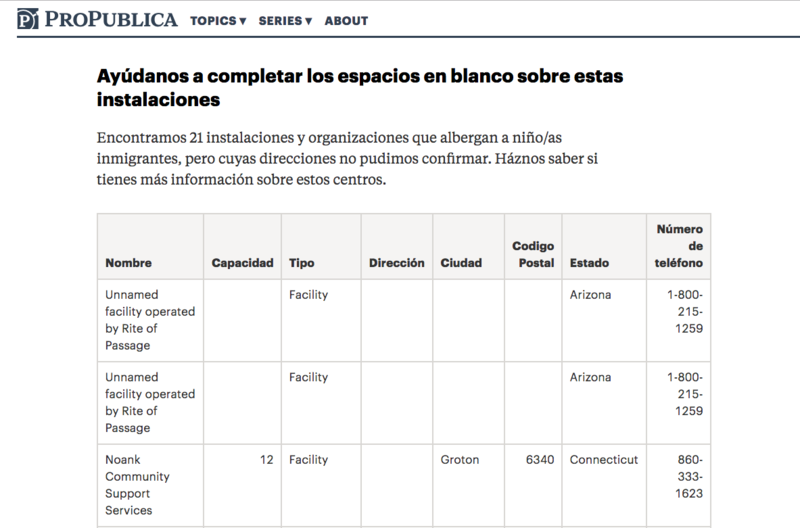 At the end of June, when ProPublica developed a map and database of detention centers across the United States to which migrant children would have been transferred, it also created a data platform accessible to all participating media. It is powered by the information provided by readers through two types of forms, available in English and Spanish. “Sé algo sobre un centro” (I know something about a center) and "Conozco a un niño en un centro de detención o refugio” (I know a child in a detention center or refuge) are the questions that the two forms ask and the answers, sent by the readers, are handled confidentially by ProPublica. This information is added to its platform which is only shown to the allies in the form of "tips" or clues. The collaborating media only receive the contact information provided by the respondents after committing to the platform to report and develop the story. "What we do not want is for a mother who has been removed from her son to be called by 50 journalists, therefore, to protect the sources and not to overwhelm them, we have created this system through which the first (allied media outlet) that sees a tip that interests it, writes to us, asks us for the contact information and we provide it," Sánchez Diez explained. Within the United States, the collaborating media are BuzzFeed News, Frontline, The Intercept, The Texas Tribune and Univisión, one of the Spanish channels most viewed by Hispanic communities in the United States. Most of the time, each allied media outlet has a person assigned to the project. At Univisión, the head of special projects and a investigative reporter are in charge of reviewing the tips published on the platform and following up on the story they want to report. On July 16, Univisión released a special “Liberados y Reunidos” (Released and Reunited) about the stories of four families that were separated. It was published simultaneously by Animal Político and El Faro. 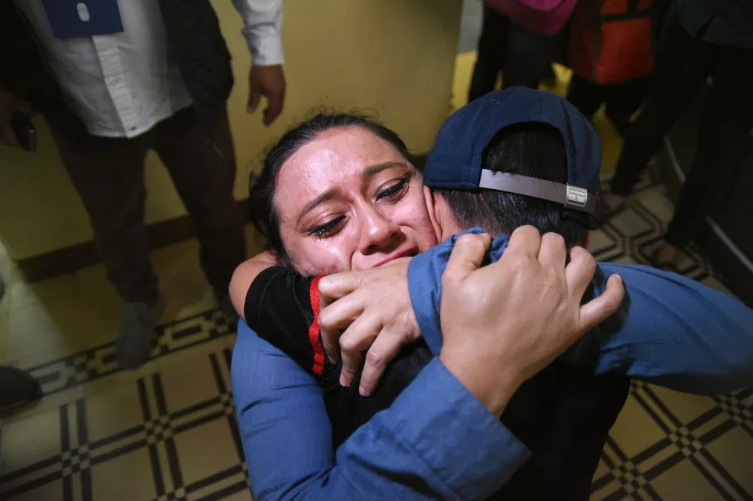 In less than a week of the stories being published, the families were reunified by the authorities, Selymar Colón, editorial manager and senior news director at Univisión, told the Knight Center. Both Colón and Sánchez Diez said that these families were reunited shortly after the publication, although they could not assure that this happened as a result of the social impact of the report. "For us, this project is at the center of Univisión’s mission: to do collaborative journalism and service journalism for the audience. We hope that with these stories (published on July 16th) we can also have more pitch from the audience, about cases that we can report on," she said. ProPublica form that can be filled out by readers who have information to help track migrant children who were separated from their parents at the US-Mexico border. In addition to the platform, ProPublica also created a messaging model to continuously disseminate and promote the project's stories on social networks, in order to facilitate communication to its allied media. "We have made some Twitter cards and some suggested copy in case they want to use them to keep the project alive in their networks, on an ongoing basis and people still have access to the forms," Sánchez Diez said. In the coming months, the participating media in this collaborative effort will continue to publish and disseminate the stories of the affected migrant families. The project will remain open for an undefined period of time, according to Sánchez Diez, while the platform continues to be fed with the information provided by the audience and those who want to contribute with important data that help to locate the more than nearly 600 children who are still not reunited with their parents. In countries like Guatemala, where people with few resources have almost no access to the Internet or a computer, according to Zamora, El Periódico plans to assign a person who can receive by telephone any information about Guatemalan children still detained in the United States. In this way, the journalist continued, they will be able to enter more data in the ProPublica forms so that the reunification of more families is possible.